The rapid proliferation of mega-structures becomes part of a packaged synthetic urbanism. The urban cannot exist instantaneously. Hans Ibelings’ Supermodernism affirms that “a new architecture now seems to be emerging, an architecture for which such postmodernist notions as place, context and identity have largely lost their meaning…To refer to this architecture, a new ‘ism’ is introduced here: supermodernism…it manifests itself chiefly in the way people deal with place and space nowadays.” Additionally, Aesthetics + Urbanism asserts that architecture is becoming more and more consumer oriented. According to Supermodernism, “the world is increasingly made up of non-places which are particularly common in the sphere of mobility and consumption. Airports, hotels, supermarkets, shopping malls, motorway stops…are all places where people occasionally spend varying lengths of time, but the functions of these spaces is quite different from, say, the village square which is the social centre of a community.” If “place is defined as an area that has acquired meaning as a result of human activities,” then if this place in fact is a non-place, it only supports a temporal population. The attempt to create a notion of place is dependent on whether this place becomes a place or a non-place. Does this place or non-place exist as a true urban addition to a city? Does it interact with its users? Or does it simply nurture a fabricated environment and become just another synthetic node? For example, OMA’s CCTV building may serve as more of a spectacle than any other practical function. Architecture as spectacle is more concerned with being popular than actually being populated. Without a user, the object building cannot be a place. Although places become inherently and synthetically urban when populated, the quality of this population must be assessed. Airports may become the ultimate synthetic mega-structure, with no true population. People come to the destination with a purpose, but do not stay for any meaningful amount of time. Temporal destinations are not significantly utilized, and can hardly become part of a true urban environment. Not only do spectacle buildings have a transient population, but as Supermodernism puts it, “this phenomenon whereby scarcely anything is tied to a particular place any more has long been an economic axiom but is now being seen as a fait accompli in architecture as well. The same building, with a few site-specific adjustments, can stand anywhere.” What does it mean if a structure is not innate to its location? Can it become part of the urban? 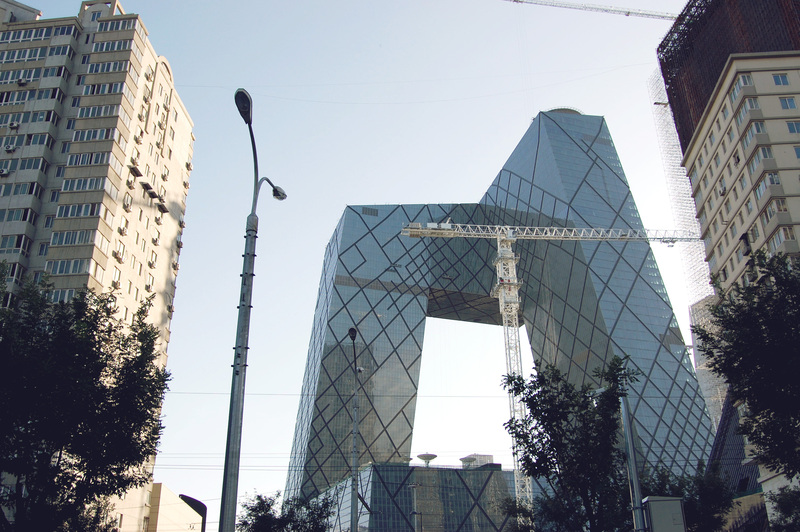 The spectacle of CCTV may work in China solely because of the type of architecture being done here. Object buildings are constructed quickly, even before they are fully programmed. Although intrinsic to the environment’s spectacular qualities, at the same time it is not fully intrinsic to the site upon which it sits. The man-made modifications to the urban environment in films such as Fritz Lang’s Metropolis and Ridley Scott’s Blade Runner promote a different class of synthetic urbanism. By altering the natural urban order, and putting the wealthy living directly above the workers and lower class of the cities represented in the films, this type of urban environment is no longer made up of non-places because these housing blocks are perpetual destinations. An attempt at urbanism which lacks a lasting population becomes synthetic—it cannot function on a true urban level.